In 1991, as a beginning quilter, I had the idea to create a whimsical quilt where a cold and perplexed Santa was stuck outside looking in. The original quilt was improvised using nothing more than a sketch I drew as a guide. I came to realize that with some very small alterations to the original I could offer a manageable and do-able paper-pieced pattern. This wall quilt has only seven paper-pieced sections and measures 40” x 46”. 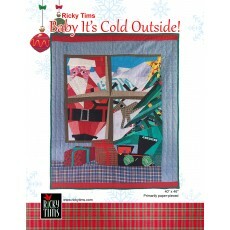 The pattern includes the full-size paper pattern so there’s no enlarging. Easy-to-understand instructions are included.